Family means safety. Family means protection. Until it doesn't. Devoted to the people she loves—more than they have ever been to her—Kate vows to protect each one. Charlie Fuse has lived on the streets since his alcoholic father threw him out. When Charlie’s powerful street family tests his loyalty by demanding that he kill the son of a rival gang leader, he refuses. They frame him for the murder, forcing Charlie to run. When Kate finds Charlie injured and penniless, she hides him from his enemies and her uncharitable relatives, unaware that he has a connection to her family as old as the hotel itself. The murderous gang tracks Charlie down. To flush him out, they take the clueless family hostage and threaten young Kate. Even then, Kate keeps Charlie hidden, putting all her childlike faith in one terrible hope: that the family who has never been able to protect her before might learn how to do it now. Kate is eleven and she lives in a hotel her family owns. It’s weird living in a hotel. She’s always been told that children should be seen and not heard. Because of that, she’s gotten very good and knowing things she shouldn’t. And very good at keeping those secrets. But it’s always just been little secrets. This time she knows that her Grandy and his friend had a big argument…and now Grandy’s friend is dead. Meanwhile, other events are coming into play that will eventually tie themselves back to the hotel. A robbery gone wrong. A kidnapped kid. A gang member seeking revenge for his son’s murder. Everything inexplicably but slowly tying themselves closer and closer to the hotel. I’ve long described Erin Healy’s novels as relational dramas. It’s the people, not their circumstances, that really drive the storyline. It’s their emotional complexity, their actions and reactions, that help you identify with them and pull you in. 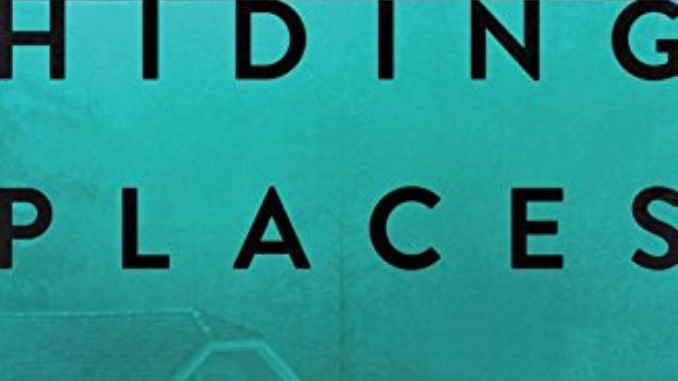 Hiding Places is no different, exploring the danger of secrets, especially life-secrets, those kinds of secrets that mask our true feelings and hide our brokenness. One of the reasons I’m a big fan of Healy is that her novels are different than most within contemporary Christian fiction. It’s not a suspense/thriller and not a romance (Amish, contemporary, or romantic suspense). It’s its own thing entirely: character driven drama that is complex and nuanced and even a bit messy. The pace is slower and thoughtful, but doesn’t drag. Not every question is answered in the typical or obvious way. Hiding Places has a cast of characters that really make the novel. Our eleven year old protagonist, Kate, is a wonderful blend of wiser than her years and adorably naïve. I also liked Great-Grandma Pearl, whose character leaves a whole story untold by the end. In all, it’s a very Erin Healy novel. If you’ve loved Erin’s previous books, you’ll love this one. But don’t be looking for a fast and light read. Hiding Places, like all Erin’s novels, is one that will have you thinking and questioning things in your own life by the end of it.